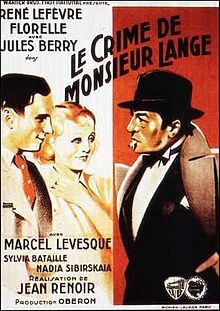 What's The Crime of Monsieur Lange (1936)? The answer might not be the murder which the Renoir film, concluding its revival at Film Forum today, portrays, but art. "Art is a lie that makes us realize truth," said Picasso. Art, artifice, factitiousness are the palette in which the film operates and the whole making of the work of art which is one of the film's subjects is corrupt from beginning to end. Admittedly, within the plot is a populist uprising, but it does little to take away from the commodification of the creative impulse which the film describes. At one point Lange (Rene Lefevre) who produces a tale set in Arizona, where he’s never been, becomes enraged with his publisher, Batala (the swaggering Jules Berry), for some advertisements which have been interjected into his narrative. The ploy will probably receive a jaded response from most contemporary viewers, who would regard the gaffe as a textbook example of product placement. There are some witty bits like one in which Batala who's presumed dead, before he’s actually shot by Lange, is disguised as a priest and comments “Life is a question of habit. You get used to it.” Lange himself complains about the backdrops that are used to create the illusion of the West for his writing. If there is a movie made, he wants something more realistic, but you might say this early Renoir success, with its story within a story structure, is as far from so-called realism as filmmaking can get.